The word 'grange' conjures up images of sophistication, style and elegance of bygone times, perhaps a residence of a gentleman farmer upon the rolling hills in England. 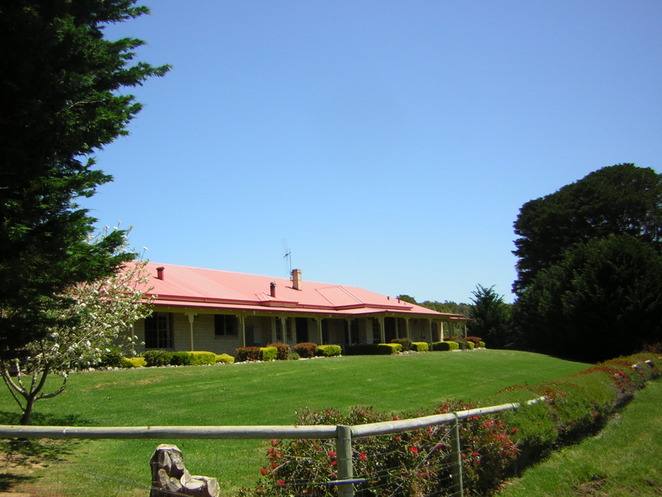 Well, The Grange in Denmark, Western Australia couldn't be any further removed from the northern hemisphere, but the ideal of gracefulness, country style and tradition is very much alive in this beautiful bed and breakfast. Most people in Western Australia are aware of Denmark's natural beauty, and The Grange is only a short stones throw away, 3 kilometres from central Denmark, atop Mt. Shadforth. From this vantage point, The Grange sits majestically, overlooking the valleys and forests below. Positioned amongst vineyards the well-appointed accommodation was custom built with comfort in mind. The Grange offers a choice of 4 well decorated roomy ensuite rooms, 3 with queen sized beds and 1 with twin beds. All beds are super deluxe to ensure a good rest after a day of exploring the region. The rooms are equipped with tea and coffee making facilities, DVD, TV and bar fridge to keep those wine purchases cool. There is a guest dining room and lounge with open fire – a great place to chat to new friends who have also discovered The Grange. There is private guest entry and an outside area to relax and enjoy the wonderful views which are available from all corners of the property. Getting back to the image of the rolling hills of England…..the hosts at this property are in fact English, from Yorkshire, and both Phillip and Jenny are truly charming, considerate and thoughtful. They go over and above the call of duty to make sure their guests have a memorable stay at their property. Ask and it shall be done seems to be their motto. Now bed and breakfast stays would not be complete without the breakfast part. Phillip cooks up a storm. Delicious home-style cooking, a well-stocked tea chest as well as the full range of fruits, cereals, homemade jams and local honey are available, but from experience, order the full cooked breakfast. Try to enjoy the breakfast, weather permitting, on the balcony, either watching the blue wrens flitting through the bushes or watching the mist rise from the valley below. Coffee and teas are available at all times of the day, along with homemade biscuits and muffins. Another big plus is the complimentary port and chocolates that are served in the evenings. The short drive down Mt Shadforth brings you to Denmark itself along with its quaintness. It's also the gateway to both Walpole and Albany, both just a short drive in either direction from Denmark. The areas around Denmark are truly breath-taking and need only a short drive to get you to complete isolation and that, "I'm the only person here," feeling. While you're in Denmark have a go at doing these free things and make sure you take the drive from Denmark to Walpole to take in more sights of this wonderful part of our state. All in all we were extremely impressed with the attention to detail, helpfulness and overall quality of our stay at The Grange and if you and your loved one find yourself there one day I'm sure you will be too. Your photos are stunning. That Blue Wren is so pretty. The views also seem spectacular. I love staying at a peaceful B&B.